Cheap wedding favor boxes are a godsend when you are organising the favors for your wedding. They are one of the neatest ways to wrap your favors and the beauty is that they will all be the same. There are two costs when you are considering favor boxes, the box and the contents. If you are thinking of having a traditional favor such as Jordan Almonds then your favor box will need to be fairly large. Have a look at your local craft shop and even a favor company to get a better idea of what box will go with what contents. If your favor is a chocolate then the small favor box will be perfect. Have a look at my great chocolate favor receipe here! I have spent ages looking for the cheapest favor boxes online and here is a selection of the best and the most reasonably priced. Another great saving with favor boxes is that you can stack them as a pyramid in the middle of the table to use as your wedding centerpiece. And if you choose your favor boxes to match with yoru theme they will be an integral part of your wedding table decorations. A useful idea if you know someone with beautiful handwriting is to write your guests' names on their favor box, they can then be used as your placecards as well. Or you can also buy fairly inexpensive personalised wedding stickers which be the finishing touch to your favors. 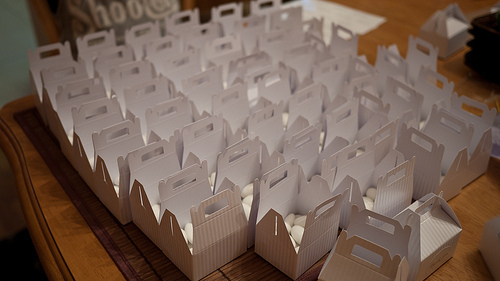 The absolute cheapest favor box is a plain box, normally white - so it will go with most wedding themes. You may want to decorate the box so make sure you cost that into your favor budget. I have spent many hours recently adding ribbons to favor boxes for a friend and when we worked out how much time we had spent, plus the cost of the ribbons and the double sided tape, it would have been cheaper to buy a pretty box in the first place!